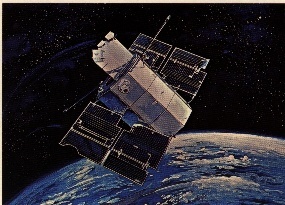 The Orbiting Astronomical Observatory-2 (OAO-2) was launched from Cape Kennedy into a 480-nautical mile circular orbit on 1968 December 7 to carry out astronomical observations in the far-ultraviolet (UV). 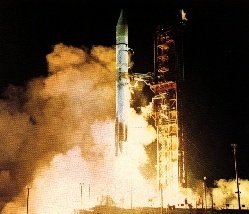 The spacecraft was launched by an Atlas-Centaur vehicle. The instrument section contained the Smithsonian Astrophysical Observatory telescopes in one end and the Wisconsin Experiment Package (WEP) looking out the other direction. The WEP consisted of five filter photometers for measurements in the wavelength interval 1330 Å - 4250 Å and two scanning spectrometers covering the region from 1050 Å to 3600 Å. OAO-2 was the first true observatory in space and was in operation from December 1968 to January 1973. The spacecraft provided power, communication, spacecraft orientation, and pointing to approximately 1 minute of arc with a stability of the order of 1 arc second, storage of commands to be performed, and storage of experimental data for later transmission to the ground. The Wisconsin instrumentation observed over 1200 objects in the UV for the first time, including planets, comets, a variety of stars, star clusters, and galaxies. Among OAO-2 results are the discovery that comets are surrounded by huge hydrogen halos; evidence that at least some novae increase their UV brightness at the same time that their visible light is fading rapidly; and that galaxies are systematically brighter in the UV than expected from the visual colors of stars which make them up. OAO data were used to investigate the physical properties of interstellar dust and to map the distribution of hydrogen near the sun; OAO data combined with measurements of angular diameters of stars enabled the first empirical determinations of the temperatures of the hotter stars.